Join us for a FREE evening of exploration Sunday, April 28th from 4-7pm at the Duxbury Bay Maritime School. Check out the event details below and register to let us know you are coming. Not sure of plans yet? No worries! Walk-ins welcome! The Center for Coastal Studies is an independent non-profit research, education and rescue organization founded in 1976. Since 1984, the Center has been the worldwide leaders of marine animal disentanglement, techniques that are now commonplace around the world. Marine Eduation Director Jesse Mechling presents Spinnaker: An Entanglement Story about the newest exhibit at the Center, a thirty-four foot humpback whale skeleton. The story of Spinnaker is partially the story of the Center itself, detailing the science and research that has gone into one of the longest population studies of whales in the world. The story also speaks of the enormous threats whales still face today. Recently questions have come up regarding the predator management program on Duxbury Beach. This is a controversial and oftentimes upsetting topic but is one of the challenges that the Duxbury Beach Reservation faces when trying to balance the many uses of the beach. As landowners and stewards of Duxbury Beach for over 100 years, the Reservation strives to maintain a balance between protecting the natural resources of the beach, including habitat for wildlife, preserving the barrier which shelters the communities behind it, and providing use of the beach for recreational purposes including over-sand vehicles. In order to provide use of the beach for recreation, habitat and species conservation regulations must be adhered to including predator management mandates by the United States Fish and Wildlife Service. Many residents of the South Shore have visited Duxbury Beach since childhood and have likely seen big changes to the beach – both through dune and infrastructure projects and in how the beach must be managed under local, state, and federal law. Duxbury Beach is unique is many ways, including the nesting habitat it affords to rare and protected shorebirds. Unfortunately, Piping Plover conservation, which is regulated under the state and federal Endangered Species Acts, can come in to conflict with human interests, including development and recreation. In order to provide greater options for beach managers working to adhere to state and federal guidelines for plover protection while providing recreational opportunities, the state of Massachusetts has a Habitat Conservation Plan under the US Fish and Wildlife Service. The Plan allows certain “risky” activities while providing mitigation to ensure the plover population is better protected overall. The Duxbury Beach Reservation received a sub-permit under this statewide plan to allow recreational driving on the back road and front beach in closer proximity to young plover chicks. Under this permit allowing recreational driving, the Duxbury Beach Reservation is responsible for continuing an intensive monitoring program and providing mitigation. As stated by Mass Wildlife, the only form of mitigation acceptable under the US Fish and Wildlife permit is lethal predator control, because it has the highest likelihood of offsetting the potential loss. Predator management is not the Reservation’s first option and is carefully considered each year and on a case by case basis. The predator management program has been in place on Duxbury Beach for 8 years. For comparison, predator management has occurred on beaches in the state of Massachusetts for over 13 years. The plan on Duxbury Beach has undergone continuance debate and study throughout its tenure, with examination by multiple agencies and several opportunities for public comment. The Duxbury Beach predator management program design was and continues to be based on extensive data collected on the beach on predator presence and egg and chick loss to ensure the program targets those species that are responsible for heavy losses. Fox have been removed 3 of the past 8 years that a predator management program has been in place, and every year the number removed has been far, far fewer than the numbers suggested on social media. This targeted removal during a limited time of year has been successful in providing two rare and protected species, the Piping Plover and Least Tern, a window of opportunity to nest and raise young on some of the little remaining nesting habitat on the east coast. It has also afforded thousands of visitors the chance to come and enjoy the beach. Instituting a predator management program is controversial, challenging, often upsetting, and may even seem counter-intuitive to many. Why remove one species so that another may succeed? Aren’t there other options? While it may seem simple to “let nature take its course” we do not operate in an entirely “natural” system. With the removal of large predators, such as wolves, from this area by the mid-20th century, mid-sized predators, including fox, coyote, and raccoons, were able to extend their ranges and increase in population in these areas. There are communities of hundreds of homes flanking Duxbury Beach that provide ample habitat for species like red fox that can do very well in suburban and even urban areas while other species, like the plovers and terns, have had habitat regularly destroyed by development. Today, the largest cause of plover and tern egg and chick loss on Duxbury Beach, and many other beaches statewide, is predation by species whose populations are not in jeopardy. Unfortunately, the common predators on Duxbury Beach, including the larger mammals (fox and coyote) and avian predators (crow and gull) are more likely to be attracted to the beach due to trash. There are staff on Duxbury Beach in the summer to pick up trash on the beach, road, and parking lots in the hopes of making the beach less attractive to animals like fox. With communities at the far end of the beach it is impossible to limit the attractiveness of Duxbury Beach to predators with large ranges. There are very few suitable denning spots on the beach and most of the large mammals come to the beach from mainland Duxbury and Marshfield where they find ample denning spots under houses, sheds, etc. Harm to the individuals removed from their territory and a struggle to find food and shelter. Humans do not always recognize appropriate habitats for wildlife and put them in bad locations. Many have questioned why Duxbury Beach does not use “wire cages” around plover nests as are sometimes seen on other beaches. These cages are predator exclosures and are oftentimes an unsuccessful and harmful tool. Unfortunately, predators (including fox, raptors, crow, and others) can target exclosures and kill adults when they switch off the nest. This is more detrimental to plover conservation than losing eggs or chicks because of the loss of future reproductive potential of the breeding adult. Predator exclosure use is highly dependent on beach, nesting site, and predator suite. On Duxbury Beach it is not typically feasible to use exclosures, however, it is carefully considered. In addition, exclosures do not work for Least Tern nests as they are colonial nesters and fly to and from the nest. In some cases, electric fencing can be used around plover and/or tern nesting areas. While this is only helpful in detracting large, mammalian predators, it does work on some beaches. Unfortunately, given the span, configuration, and location (dynamic beach), electric fencing is not feasible on Duxbury Beach. This is not an easy topic and one that is discussed and voted on annually by the Reservation’s board. The Reservation will continue to collect and analyze data and assess all possible options for conservation and site management in order to protect the natural resources of the beach and maintain the protective barrier, while providing access for recreation where possible. The Reservation will also continue to work with state and federal regulators to find the best options for protection on Duxbury Beach in order to adhere to the laws we must operate under. We appreciate everyone who has taken the time to learn more about the work and understand that we are doing our upmost to strike a balance between the many uses of Duxbury Beach. If you are interested in learning more about statewide shorebird conservation efforts or predator management work, we recommend you check out this link to MassWildlife’s Piping Plover Habitat Conservation Plan web page. What is Project Access for All? Project Access for All is Duxbury Beach Reservation’s new initiative to make Duxbury Beach more accessible. 26,500 individuals in Plymouth County alone live with conditions that limit their mobility, and the beach hosts more than 2,000 guests daily from around the world. We believe that all of these guests should be able to access Duxbury Beach regardless of their ability levels, and that you can play a role in making this dream a reality! Visit www.gofundme.com/duxburybeach to donate today! Who is Duxbury Beach Reservation? Duxbury Beach Reservation, Inc. (DBR) is a 501(c)(3) nonprofit. Duxbury Beach Reservation owns and operates Duxbury Beach, a 4.5 mile long barrier beach in Duxbury, MA. Duxbury Beach Reservation strives to preserve the ecology of Duxbury Beach while also maintaining it as a recreational area. In the past, Duxbury Beach has offered limited accommodations for wheelchair users through three wooden ramps at different spots on the beach. In addition, DBR has multiple beach wheelchairs so more visitors can access and enjoy the water. The Reservation received a new beach wheelchair with floats last summer from the Arc of Greater Plymouth. Unfortunately, the nor’easters that slammed Duxbury Beach last March left two of the handicap accessible ramps unusable. This is where you come in! In summer 2018, Duxbury Beach Reservation had the opportunity to test a more adaptable type of ramp called a mobility mat. The mat was placed over one of the paths leading from the parking lot to the beach, and it was a huge success. With your help we can make these improved access paths an annual fixture on Duxbury Beach. 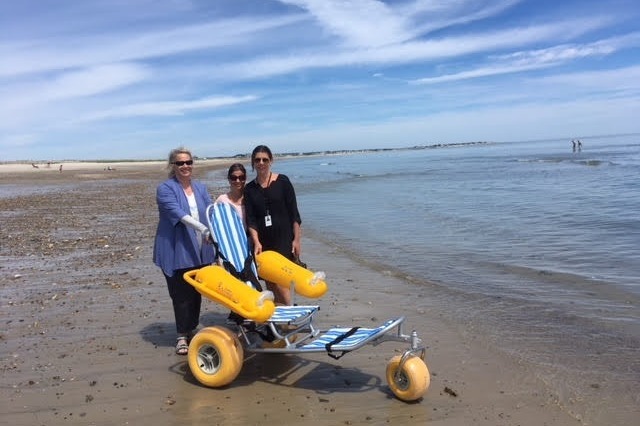 Duxbury Beach Reservation Executive Director Cris Luttazi, along with Cari Robbins and Kristine Marquis from the Arc of Greater Plymouth, with our donated beach wheelchair! Mobility mats being installed on Duxbury Beach for the 2018 season. Your donation will ensure that everyone who visits Duxbury Beach, from wheelchair users to parents with strollers and cooler-towing beachgoers, can enjoy their trip to the fullest! By donating to Project Access for All you will help raise funds to install 5-foot-wide mobility mats on three different paths. With your help, we can cover 485 feet of pathway with mobility mats. 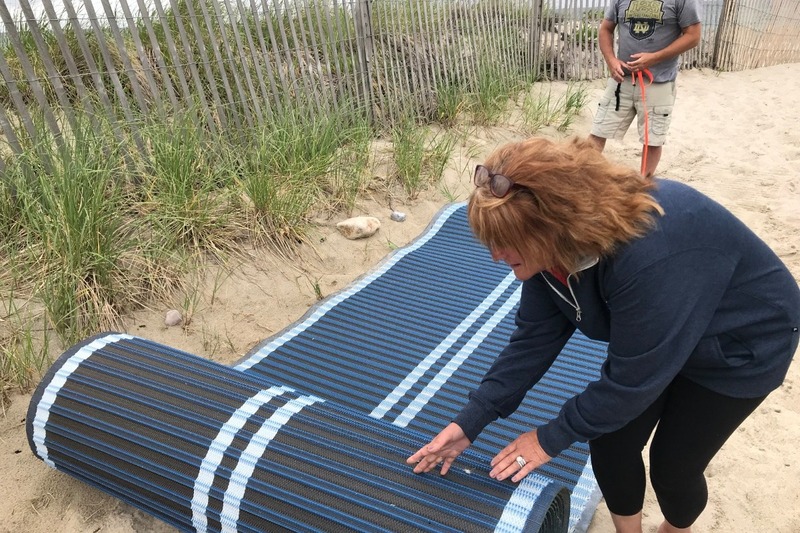 The mats will be placed at paths on the ocean side beach across from the Powder Point Bridge, the bay side beach near the Powder Point Bridge, and the ocean side beach near the Duxbury Beach Park Pavilion. Your contribution can help make Duxbury Beach more accessible than ever before! Each segment of mobility mat costs $45 per foot, plus additional taxes and fees. Our 485-foot-long pathway will come out to $25,000. You can help make Duxbury Beach Accessible for All by donating through this page. All donors will receive a commemorative Duxbury Beach Reservation sticker as a thank you from our team. If you donate $250 or more, you will also receive a special thank you shout out on this page as a “Fund Five Feet” donor! Help get the word out about this project! Share this page on Facebook, Twitter, and Instagram. Be sure to tag Duxbury Beach and follow us on social media so you can see how your contribution makes Duxbury Beach accessible for all! Facebook: Duxbury Beach Reservation, Inc.
To ensure that our mobility mats are in top shape for years to come, we will regularly sweep them and remove any debris as it comes. Mats will be available on the beach for the entirety of the summer season. During the off season, mats will be removed from the beach, cleaned, and stored in Duxbury Beach facilities. Thank you for helping make Duxbury Beach accessible for all! Please stay below the temporary fencing added south of Crossover 1. The fencing does not extend the entire length of the restored area but please be sure to stay below the imaginary line running along the toe of the dune. Driving on the dune slope is very damaging and decreases the strength of the barrier beach! Duxbury Beach has a big year coming up! To start it off right we need all hands on deck to clean-up the beach. Get an early start on beach season Saturday, March 23rd from 9am-12pm, for a beach-wide clean-up. Sign-up for the Duxbury Beach Spring Clean-up! Crossover 1 will be closed 2/20 and 2/21 due to construction. Crossover 2 will be opened during the closure for access to the drive-on portion of the beach. There are many reasons to love Duxbury Beach. While we may have different reasons, we all agree that it is vital to keep the beach protected so we and future generations can enjoy it. Show how much you care this Valentine’s Day by supporting the restoration projects that keep it strong and healthy. Click here to donate and support Duxbury Beach Reservation’s work to protect and preserve Duxbury Beach. Dune Restoration Update: Due to the extreme cold temperatures, work is on hold and will resume next week, Tuesday-Friday. Hopefully some milder temps will speed up work and move us close to finishing the sand installation part of the project. This fall, beach operations on the town-leased portion of Duxbury Beach transferred from the Harbormaster Department to the Police Department. To stay up to date on closures, stickers, bridge work, etc., make sure to follow @DPD_Beach_Ops on Twitter!